New cutting edge broadband technology is heading to the West Midlands as Openreach gets ready to make its new network available to more than 34,000 homes and businesses there. People living in areas including Birmingham, Leamington Spa, Telford and Wolverhampton interested in upgrading their broadband to the new service can see if they’re able to connect by entering their postcode into Openreach’s online fibre checker at openreach.co.uk. The locations are some of 59 new areas across the UK set to benefit from next generation Gfast broadband technology* being used by Britain’s largest digital network builder. More than 370,000 homes and businesses will be able to order ultrafast broadband in these areas. It’s a further boost for the West Midlands, which was also announced earlier this year as one of the areas to benefit from Openreach’s biggest ever recruitment of more than 3,500 trainee engineers. Around 200 are being hired across the West Midlands. The new network is more secure and reliable than existing technology. It uses special software that can detect and fix issues before customers even notice and provides a faster, more stable service making it ideal for home workers and small business use, helping to boost productivity and, in turn, the local economy. The increased bandwidth is enough to allow you to have a 4K TV running in every room of your house simultaneously, or pick a film just before leaving the house, hit download, and it would be ready to watch on your phone or tablet almost immediately. It also provides enough additional capacity to ensure broadband connections to homes and businesses are able to support future data-hungry services and applications, such as Virtual Reality gaming and the smart homes, where a network of online sensors can coordinate and control home appliances – from thermostats, door bells and security cameras to door locks, lawn sprinklers, window blinds and washing machines. 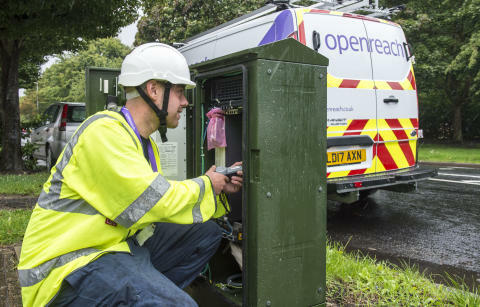 Kim Mears, Openreach’s infrastructure development director, said: “Our engineers are working across the region – installing cutting edge technology to make faster, more reliable broadband services available. We’re keen for people to check it out and experience the difference an ultrafast connection can make. This latest rollout across the West Midlands is part of a much wider commitment from Openreach, who provide the telephone and broadband network used by the likes of BT, Sky, TalkTalk and Vodafone. The company has already made ultrafast broadband available to more than one and a half million premises across the UK, and has ambitions to go even further. An ambitious ‘Fibre First’ programme, which includes Birmingham, aims to reach three million premises by the end of 2020 – using ‘Fibre to the Premises’ technology – where fibre optic cables are laid from the exchange right to people’s front doors. Openreach wants to extend this rollout still further to around 10 million premises by the mid-2020s, and ultimately the majority of homes and businesses across Britain if it has the right conditions to invest. We’re working hard to give people the speeds they need to run and enjoy their daily lives. Over the last decade, we’ve invested more than £11 billion into our network and we now manage more than 160 million kilometers of cable stretching from Scotland to Cornwall, from Wales to the east coast. And we’re continuing to take that network further - making superfast broadband speeds available to thousands more homes and businesses every week.